Kona Hawaii is on the West Coast of the Big Island, which includes north Kona, the most populous area of West Hawaii. You can find a wide range of sights of attractions to enjoy, from the artist's colony at Holualoa to the town of Kailua-Kona. South Kona has a feeling of the countryside, and the coffee farms that produce the famous Kona Coffee can be found here. The town on Kailua-Kona is very romantic, with its sun soaked beaches and fiery sunsets. There is no lack of things to do here around the town of Kailua Kona, like snorkeling, scuba diving, deep-sea fishing and surfing. If you tire of the beach, try taking a day tour to one of the coffee farms, or spend a day browsing the many small shops. Shopping is most plentiful around Kona. You could spend a few days alone simply exploring the Kona district. This area is filled with historic landmarks, such as the Hulihee Palace, and the location of Captain Cooks demise, Kealakekua Bay. In South Kona, on highway 60, is a reconstruction at Puuhonua o Honaunau National Historical Park, or "Place of Refuge", where outcasts who had broken the rules of the traditional Hawaiian laws could find a sanctuary. There are also many traditional churches in Kona. Green Sea Turtles (Honu) are common on the west side of The Big Island. These docile animals are to be appreciated and respected. (Please do not try to touch or feed them!) You can often find them basking on sandy shores within a few feet of sunbathers and snorkelers. If you re lucky enough to see one swimming, they are especially graceful, considering their cumbersome appearance! Dolphins are also a common site along the Kona coast, especially south toward Captain Cook. They are mostly friendly and inquisitive, and my swim up next to your Kayak, or do some jumps to get your attention. Since this is one of the most visited areas on the Big Island, attractions around Kona are plentiful. You have the entire west coast of the Big Island to choose from, so whether you prefer the rural feel of the south, or the remote beaches of the north, you will find the best way to enjoy the big island your way. You are going to be rewarded with having proximity to the beaches and the Ocean when you decide to book your vacation rental in Kona. One of the most famous companies that offer tours is the Holualoa Kona Coffee Company, which prides itself on growing all natural pesticide free coffee. You can sample a taste of fresh Kona coffee while you're in the mill. Only 10 minutes south from Kailua-Kona, this is a fun and informative day trip that will reward you with views of the Kona coast from the sloping hills the Kona coffee beans are grown on. Travel further south to really begin to see how diverse the island is. Often called the Orchid Isle for its heavy blankets of fragrant orchid flowers, the Big Island was given it’s name to avoid confusion with the other islands of Kauai, Maui and Oahu. In the past, the name Hawaii was used to describe both the chain of islands and the Big Island of Hawaii itself. The Big Island Hawaii is twice as large as the other islands combined and with two volcanoes still active, one which is the most volatile in the world, the island continues growing. Mauna Kea and Kohala are Big Island’s extinct volcanoes while Hualalai is considered dormant. The volcanoes are an integral part of Hawaii and create fascinating landscapes and backdrops that attract thousands each year. Literally divided in half by a high mountain range, the eastern part (Hilo Side) of the Big Island is hit by southwest trade winds bringing an onslaught of rainy Hawaiian weather. The clouds can’t reach the leeward, or west side until they jettison their rain along the windward coast. This creates a major distinction, and a naturally curious ecosystem as the south is riddled with rain while Kohala and Kona, the most popular destinations on the Big Island of Hawaii, take in less than 10 inches annually. Hilo, a popular stop on a Big Island vacation, is an excellent town to visit on the east coast but not recommended for extended stays. There are several terrific attractions to visit in and around Hilo along the windward side during a Big Island vacation. Traveling north, you’ll reach Akaka Falls and it’s smaller mate, Kahuna Falls. Further northeast is Mauna Kea, a snow-capped volcanic mountain most popular for incredible star gazing opportunities. Big Island tours to the summit are really popular and with some of the world’s most powerful telescopes, visibility is amazing. Big Island activities at Mauna Kea also include a trip to the visitors center and sunset tours. Liliuokalani Garden is perfect for a relaxing afternoon visit. A stroll around the garden, some people-watching and a picnic caps off an afternoon and slows the pace down. For a truly stunning Garden walk, visit the Hawai'i Tropical Botanical Garden, located 8 1/2 miles north of Hilo. This is considered the best garden on the Big Island by most, and has many stunning views and photo opportunities! The Garden features towering Heliconias and Bamboo, beautiful Gingers, a relaxing Koi pond, and a great Visitors Center and Gift Shop. The Big Island Hawaii is also well known for its fun events and holidays. When in the area on a Big Island vacation don’t miss any current events or you’ll miss a chance to experience the Aloha spirit at its finest. In April Big Island activities include attending the Merrie Monarch Hula Festival in Hilo. With total emphasis on Hawaiian history and culture, the week-long festival hosts demonstrations, craft fairs, art exhibits, exciting performances, a large parade and a three-day hula competition! Each year in Kona, Big Island Hawaii hosts the Ironman Triathlon World Championships which kicks off in October. Coffee lovers flock to the fun Kona Coffee Festival each year in November to taste world renowned Kona coffee. There are so many Big Island activities to enjoy that a well-planned trip is the best way to go. Popular tours include snorkeling, whale watching, scuba diving, manta ray night dives, dolphin sails and helicopter tours. Horseback riding, Hawaii hiking, cycling, and scenic drives are also great ways to see more of the island’s stunning landscape. Volcanoes National Park is a must-see on a list of things to do on the Big Island and can be explored in many ways, for a few hours or a few days. Big Island beaches are unique and display white, golden, "salt & pepper", green and black sand. Though smaller in number than the other islands, they exhibit a raw, powerful beauty and many are great for an afternoon of family seaside fun. An important aspect to know is the Big Island of Hawaii is not easily driven around. The loop encompasses more than 200 miles and stopping to see attractions makes the trip much longer. Visitors can make an adventure of it easily beginning with exploring the Kohala and Kona areas first. Hit the north coast next and drive around stopping in Hilo for a look around and a nice lunch. Leaving Hilo, the next obvious stop is Volcanoes National Park. If there’s time, consider taking a full day to explore the fascinating and uniquely beautiful and dramatic terrain. Swing around to the southern coast, stopping as you wish on your way back to Kona. To really see the island, a drive around is the best way. There are plenty of stops for enjoying Big Island activities like golfing, surfing and swimming. For the "Circle Island Drive", plan on an early start! ...It will take up the entire day. If the island journey sounds like an exhaustive journey, stick to the west Kona Kohala Coast and amp up your Big Island of Hawaii trip by opting for various tours in the area. Take in a Big Island luau, relax on your private lanai at sunset and simply let go of it all as you soak up all that the Big Island has to give. The idea of a Hawaiian luau, a traditional way of celebrating events and holidays on the islands, is an intriguing concept and one most visitors want to experience. Although the main Hawaiian island is known as Big Island, there are relatively fewer luaus to enjoy than there are on the other islands of Maui, Kauai and Oahu due to less commercialism. Those interested in a Hawaii luau vacation adventure can choose from a handful of luaus and what they lack in number, most make up for in quality. The Luau's near Kona are very close to true tradition, and are a wonderful evening of music, culture, dance, and of course...food and drink! One of the best choices for a Big Island luau is held on the beautiful grounds of the King Kamehameha Kona Beach Hotel. The hotel is the former estate of King Kamehameha adding an extra dose of Hawaiian history to the royal experience. The Hawaiian greeting includes a special shell lei and a commemorative photo. Guest are encouraged to relax and participate in Polynesian arts and crafts and a meet-and-greet with the Big Island luau performers before they take to the stage. We suggest arriving early and seeing the wonderful portraits of Hawaiian Royalty in the lobby and halls of the Hotel. There are some nice Shops in the Hotel as well. An open bar is available and soft drinks, or fruit punch are always n option. Following is the Royal Court procession and the uncovering of the traditional imu oven. The feast features tantalizing Hawaiian cuisine of succulent meats, tasty side dishes and a several delicious desserts. The Polynesian Revue is the highlight of the evening festivities featuring war dances, graceful hula dancing, and exciting Samoan Fire Knife dancing. Hawaii luau packages are available at several Kona area hotels, or you can simply book online, or call on the phone. Hawaii luau packages are also available for the Royal Kona Luau performed at the Royal Kona resort in Kailua-Kona. The packages can be paired with several island activities such as an exciting snorkeling adventure, whale watching excursions and Hawaii helicopter tours. The Big Island luau includes an incredible Polynesian buffet, live traditional music and plenty of hula dancing. The buffet is brimming with local favorites like kalua pork, poi, lomi lomi and mahi mahi. The breathtaking seaside location adds an exciting element to the show during Hawaii luau vacation festivities. Hawaii luau packages offered on the island often include a choice in seating. VIP seats, the closest to the luau shows, are the most expensive while basic packages often come with seats that could be obscured by others so make note of the seating arrangements before buying tickets. When choosing a Hawaii luau, package deals can sometimes be deceiving. When pairing any Hawaii tours with a luau check the individual prices before purchasing a package to make sure you’re getting a good deal. Also, we do not recommend taking a package deal that includes a requirement to "tour" a Time Share! A Big Island luau is often set at an affordable price with smaller children usually attending for a discounted rate. The feasts are normally all-you-can-eat and provide fare that caters to most all tastes. Often there’s also a child’s menu for finicky eaters, but it is suggested to inquire first. Luaus offer a fast paced, hypnotic Polynesian revue featuring a detailed look into many fascinating cultural traditions from all over the South Pacific. A luau is one of the best ways to soak up the island culture while enjoying a fun family evening. Bring your camera, but inquire if video is allowed. 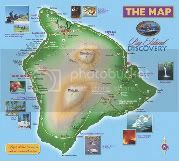 A few tourists may visit the Big Island and leave feeling a bit disappointed because of the smaller number of beaches. Oahu, Maui and Kauai offer hundreds of stunning Hawaii beaches for sun worshipers and water sport enthusiasts yet the Big Island exhibits its own unique and rugged appeal. This isn’t to say there are not any Big Island beaches worth visiting, because there are many, though they can sometimes be a bit more crowded than other island beaches. The Big Island is the youngest in the island chain and hasn’t yet enjoyed a large addition of Hawaii beaches created by thousands of years of ocean waves crashing into rocks and shells. Kona itself has several small beach areas, among them is Kahalu'u Beach. Most people just call it "Snorkel Beach", since it's one of the best places for even beginner's to see many beautiful fish. A morning adventure usually offers the most fish, and usually just wading into the water will let you see many beautiful fish. Along the popular Kohala Coast, Big Island beaches include the very family-friendly and highly regarded Hapuna Beach, 30 miles north of Kona. This pristine stretch of white sand extends into the ocean creating an expanse of soft ocean floor great for wading along the coastline. The many things to do on Hapuna will satisfy all ages and many interests. Big Island surfing, body and boogie boarding are all a great way to pass away a warm afternoon on Hapuna beach. Sunbathers enjoy the expansive width of the beach, allowing for plenty of space to spread out and play. This is a very Family Friendly beach, with ample parking, shaded areas, and Handicap access as well. The best time to go to Hapuna Beach is during the week as the weekends are generally more crowded. The winter months may occasionally present rough conditions unsuited for swimming, so it is best to check first. This Big Island beaches grassy areas, covered pavilions, restrooms and palm trees are ideal amenities for enjoying a full day seaside. Bring the cooler and pack a nice lunch to enjoy the whole day. Concession stands offer cold drinks, snow cones and other snacks. We supply a large amount of amenities for your beach excursions: Boogie Boards, towels, mats, coolers, umbrellas, beach chairs, and sand toys too. Also, a nice selection of assorted Snorkel gear. Black sand beaches in Hawaii are a big hit with tourists who have never had the pleasure to experience them before. They’re created over time by tiny fragments of ground up lava rock. Black sand beaches on the Big Island to visit include Punalu'u Beach on the southeast coast. The beach is popular for its incredible onyx hued sand and also because it’s a well known nesting site for green turtles. The trade off for visiting the beautiful area is facilities aren’t nearly as many as other beaches and the access is rocky. The perk is few visitors venture this far to the southern Ka'u district affording more privacy than many other beaches. This is a great stop on your way to Volcano. Also situated along the Kohala Coast is another of the best Big island beaches to spend some time on. Mauna Kea Beach is considered one of the top beaches in the world. Soft, golden sand is bordered by a large coconut grove on one side and crystal clear ocean water on the other creating a stunning, picturesque backdrop. One of the Big Island resorts maintains the beach and only permits a certain number of visitors per day so it’s best to arrive in the early morning. Parking is also limited, furthering the incentive to get there before the area is staked out by others. Kona and the surrounding areas are host to some great souvenir shopping and Farmers Markets. The downtown Kona shopping district has numerous small and very individualized shops. Everything from jewelry, to clothing, souvenirs, art galleries, hand made items, and of course Kona Coffee can be found. Inter mingled thru these shops are some very fun restaurants as well. Plan an afternoon to stroll down historic Alii Drive. There is also one of the best Farmers Markets in Kona as well. Kona Village Farmers Market (http://www.konafarmersmarket.com) Located on the corner of Alii Drive and Hualalai Road, it always has a great selection of local fruit, vegetables, and flowers. There are some fun jewelry, artwork, and souvenir vendors too. Their hours may vary by season, but their usually open Wednesday through Sunday.